The year 2017 is slowly but surely coming to an end and it is time to start looking ahead to 2018. 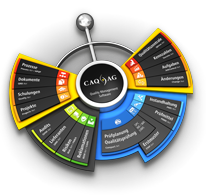 In order to ensure that you continue to be as well organized as you were in 2017, we are once again offering our customers a 70 x 100 cm CAQ AG annual planner. Please note that the calendar is designed for the German market and, hence, only features German public holidays and school holiday listings. In order to protect the environment, we will not be sending the annual planners to everyone automatically. You can, instead, order one or more annual planners directly here until the 30th of November 2017.